So begins Song of Contagion, in the atmospheric setting of a classic Victorian music hall, taking you to the very heart of East London, where cholera raged 150 years ago. The cause unknown, wild theories abound, but eventually the problem is solved: fresh water and an effective sewage system are the answer. Meanwhile Indian voices and instruments describe an equally virulent epidemic gripping Kolkata, in West Bengal; but no such steps are taken there, and thousands continue to die from the disease. GUO musicians animate the lines on this graph, projected behind them. Strings buzz away over drums and bass – the activism of mainly gay men; saxophones portray growing public awareness and media attention, and trombones the initially reluctant government funding for treatment, while a menacing bass drum marks the ever-increasing death rate. Then the trumpets announce a treatment has been found – an expensive one, but the drum beats fade. Meanwhile, millions of families living with the disease in Africa can’t all be treated until medication is cheaper. Against an African rhythm now, the strings, saxophones and trombones again get to work and the trumpets mellow as the price falls. In some parts of the world, the disease is now being treated, thanks to public awareness and action, but there is still much to be done; as the choir warns us, “easy to turn our backs now – but silence is consent”. A mosquito begins to dance over a lilting rhythm from central Africa, where dengue fever is endemic and has been killing tens of thousands for years. However “it’s not going to play if it’s too far away – get lost, I’ve got papers to sell!” is a newspaper editor’s cynical response. Next, with soca and steel pans, she spreads the disease to the Caribbean, but “if the rum is still flowing and tourists keep going, where’s the drama?” the editor says. Trying a different tack, she sambas off to Brazil, where “…Zika may spoil the Olympics: there’s babies being born with small heads” – “now you’re talking!” the editor said. 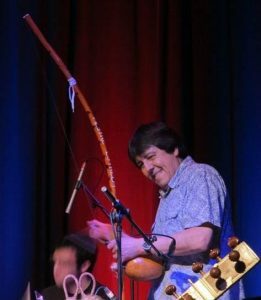 The mosquito dances off to an exuberant big-band number featuring drums and percussion from all over Africa, the Caribbean and Latin-America. Now the sound of a heart beat fills the Hall, and its graphic wave fills the screen, a portent of CHD – Coronary Heart Disease. Against this pulse, performers press sweets on the audience, muttering fragments of old music hall songs – “when my sugar walks down the street…”, “I’ll be your sweetheart…”, “a little of what you fancy does you good…”. A ghost of Wilton’s past – an old music hall comedian – appears, hymning a lifestyle promoted by the junk food industry. The heartbeat on the screen begins to stutter, the band becomes ragged and the pulse erratic – “a little … of what you fancy … does you … in”. Three dramatic stories now follow, vividly brought to life in a series of flashbacks. This is the experience of people suffering from Post Traumatic Stress Disorder. A survivor of the Bangladesh/Pakistan war recalls being hunted down in the mountains “jolche shorbanash / everything is burning”, while a villager fears for the future of her family; in Angola, a Portuguese conscript soldier wearied of the relentless jungle warfare “as colunas partiam a madrugada / the platoons set off every morning” attempts suicide and is attended by a medical orderly; a refugee from the war in Syria tries to console her child, haunted by the loss of her father and husband. The nightmares dissolve into a poignant epilogue – “If music could bind up the silent wound, we would do that; if music could, we would…” Each of the singers ponders on the grudging support society offers survivors of conflict, especially innocent victims, and the limited power of artists to intervene. The audience leaves the Hall and steps back out to Cable Street; they are asked to reflect on what they’ve heard, the need for action, the power of unity and activism, and the positive effects of intervention. A more detailed version of this scenario, and information about the performers, can be found here on the Grand Union Orchestra website. 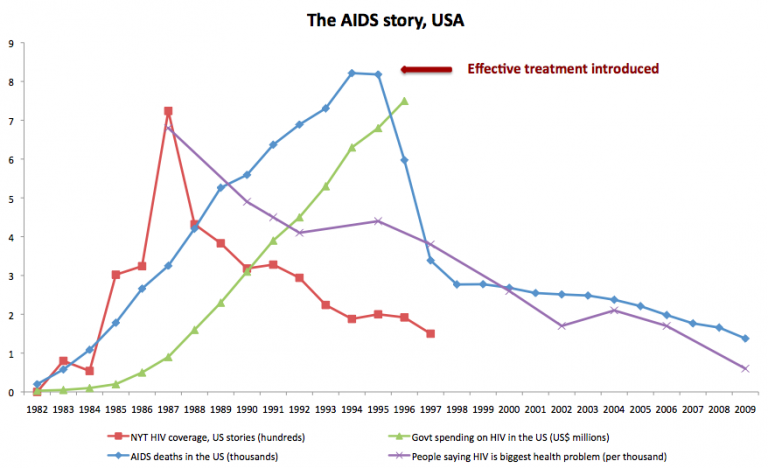 The HIV band plays on… and on…. My personal Groundhog Day is the biennial AIDS conference, bustling with passionate activits, hopeful researchers, singing orphans. This year’s conference (held in Durban in July) had a greater sense of deja vu than most. After a brief blip of “End of AIDS” optimism at the 2014 conference, even Bill Gates was brought back down to earth: biomedical solutions alone won’t work. Actually, with 17 million people on effective treatment, we’re much closer to the end of AIDS than we imagined when the AIDS circus last came to Durban 16 years ago. We’re just not any nearer to the end of HIV. As deaths drop off, the number of people living with the virus rises. If you take a squint at the graphs that the musicians are “playing” in the video below, you can see the shape of AIDS deaths (dramatic peak, steep decline — the data are for the US) but also the steep and continuing rise in cost of treatment. Not shown, but even more dramatic, is the rise in the number people who have HIV and are sexually active. So despite the fact that effective treatment reduces the chance of passing on the virus, the number of new HIV infections added to the global pool each year is not falling: around 2.1 million new infections in 2015. As well as musicians, many students and global health professionals who participated in the launch workshop on April 23rd returned, and – whether they regarded themselves and musical or not! – joined in all the activities with grace and enthusiasm. Elizabeth began the day by profiling various diseases and isolating the parameters by which they can be defined (and the relative importance we attach to treating and funding them). Tony then identified ‘musical parameters’ in a similar way; and with the aid of the musicians, demonstrated how variations of a piece of music can be achieved, while the separate elements of which it is comprised – melody, harmony, rhythm and so on – still remain recognisable. To kick off the practical exploration, joining the disease parameters to the musical ones, Elizabeth produced some very vivid graphs, turning statistical data effectively into pictures, which the group proceeded interpret through music, turning them into some very dramatic and colourful musical pieces. or ‘vignettes’. As a result, we now have some emergent ‘repertoire’, but more importantly a number of creative strategies for generating further musical material. Song of Contagion is born! The jackpot in terms of getting funding and attention is a disease which is really ‘scary’ but in a ‘cuddly’ population: for example HIV in innocent children. The worst case seems to be a disease which is relatively benign, affecting ‘yucky’ populations — by yucky, we really meant populations that aren’t good for photo opportunities or pulling on heartstrings. Chronic conditions in the grossly overweight are hard to get people excited about, for example. Unless, of course, you’re an executive in a Pharma company. Then, you LOVE chronic conditions because they mean people gave to take drugs every day of their lives. The discussions were rich, varied and lively, and that’s before Tony, Tony and Carlos got the instruments out and set us off on demonstration of the musical parameters. This part of the journey will continue in later workshops discussing and exploring these parameters through practical, hands-on, creative music-making – in which everyone can play a part, regardless of musical skill or experience. Much more in a while, but for now, thanks very much to everyone who participated for giving up your Saturday to fill our heads and hearts with endless exciting possibilities. We look forward to the rest of the journey. It promises to be great fun, even for those of us who would put statistics at the benign and music at the scary end of the spectrum. Please join in at any stage. For a lifelong addict of long shots – not just on the turf, but having virtually founded a professional career on backing long shots! – it was impossible to resist. A few days before Christmas, I met Elizabeth for a coffee in the Empire café. I was very taken with Elizabeth’s ideas. In spite of her protestations that she has “not a musical bone in my body”, she has a remarkable imagination and an instinctive grasp of how music works. Her notion was to characterise different diseases, through statistics that measured how widely they were spread, the demographic they affected or geographical area they covered, the amount of publicity they received, and whether or not treatment was well funded. What if each of these factors could be attached to appropriate musical elements – like melody, harmony, rhythm, tempo, volume? Through variations in these ‘parameters’ she imagined you would get a series of pieces where AIDS, Ebola, malaria, cholera and so on would sound very different from each other. Then you might arouse public awareness of inequality, touching people directly in a way that – as she put it – PowerPoint presentations cannot. The first step was clearly to start raising money. Elizabeth suggested this project might appeal to the Wellcome Trust, which has an unrivalled reputation for supporting arts projects explaining or inspired by science. We had a great conversation with one of their officers, who immediately saw the potential of the project, and offered very encouraging advice; slightly to Elizabeth’s chagrin, he suggested we should not dwell too much on the statistics – what they really wanted to come out of their funding was new, imaginative art! So we put in an application, and were delighted to hear in the New Year that it had been successful. What appealed to the Trust was not only the quality of the artistic ideas, but that built into the project was a participatory programme. From the very beginning young people, students and adults interested in health issues and/or music would be involved in initial discussions and the continued development of the material. It was also clear that there was great potential for music technology to play a part – exploring the parameters digitally, sampling and treating the acoustic instruments and so on. So we enlisted CM Sounds, who work extensively with young producers and creators in this field, as partners. We also wanted to focus activity on East London. Grand Union is based in Bethnal Green, CM in Whitechapel, most members of our Youth Orchestra and World Choir live nearby, and many of our events take place in local venues like Rich Mix, Wilton’s Music Hall and the Hackney Empire. But more importantly, because of the extraordinarily diverse demographic of the East End, this would mean that there would be people involved with a direct connection to countries and communities around the world who experience disease and how it is treated. This would give the impact of the project further authenticity. 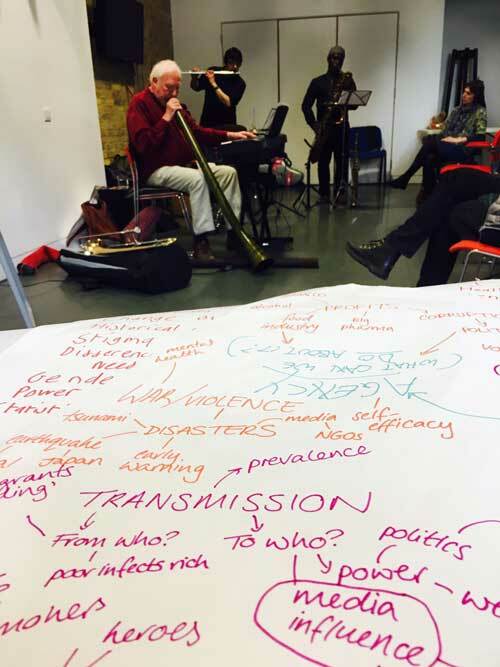 At the first workshop (April 23rd in Graeae Theatre studios) Elizabeth introduces the project, questioning why some diseases capture public attention and funding, while others are ignored. Using statistics to illustrate her points, she leads a discussion about fashion, politics, money and other factors that influence decision-making in health. Participants then split into smaller groups to identify what diseases they think are most important, which factors distinguish them; and, if they don’t get the attention they deserve, which factors are getting in the way. 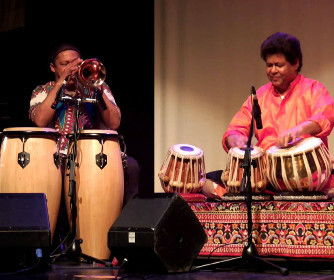 I then show, with the help of Grand Union musicians, how all music is a combination of separate elements – melody, harmony, rhythm, tempo, dynamics etc – which different forms of music combine with varying degrees of emphasis. The core of this project is to attach musical features to the statistical factors, so participants again split into smaller groups to discuss which parameters in the profile of a disease might correspond with an appropriate musical parameter, and how a musical ‘picture’ of a disease might emerge. At the end of the day, we discuss suggestions that have arisen, which diseases it might be most instructive or fruitful to address, the most significant scientific parameters and their musical expression. Elizabeth then goes away to compile appropriate statistical data. Elizabeth and myself reflect on and digest all the material generated – from discussion points to musical themes – and decide how best to develop it into a coherent and gripping public performance. Grand Union and CM run a series of workshops during the autumn with the GU Youth Orchestra and World Choir and the students from CM. It is likely that some narrative material will be needed, including lyrics, to which workshop participants can contribute; and I shall write some new songs and begin to organise the material into a coherent, large-scale musical structure. Early in 2017 a show will emerge, and we intend the performance to include also contributions from Elizabeth herself (here is a sample of her performance skills!) and the CM musicians alongside the full Grand Union Orchestra, Youth Orchestra and Choir. This – the latest in a long and impressive line of Grand Union shows – will be presented at the Hackney Empire. Meanwhile, I shall use my Blog to report from time to time on how the project is developing, with my usual notated musical examples, video and recordings. I’ll cross-post blogs here to Song of Contagion, so do sign up for e-mail alerts.